Bright, beautiful colors make this wooded scene fun and whimsical. Come enjoy your favorite drink with us while creating your own whimsical wood scene! THIS EVENT HAS BEEN CANCELLED |Online reservations strongly suggested. |This party is subject to cancellation if we have 2 or less paid reservations 2 hours prior to the start time. All guests will be notified of a cancellation with the contact information each guest provides if a cancellation occurs. |This is an 18 and older event. Parties for children are held on Saturday afternoons. Celebrate the Pink Moon tonight! |Online reservations strongly suggested. |This party is subject to cancellation if we have 2 or less paid reservations 2 hours prior to the start time. All guests will be notified of a cancellation with the contact information each guest provides if a cancellation occurs. Ahoy matey! You got the wind blowing through your hair, the sun is shining, your favorite song playing… Life is Good! Celebrate the love of wine with a glass-clinking toast and this is what you get, a Splash of beautifully antiqued colors and shimmer in this fun wine painting. Commemorate a special anniversary or important event by adding initials or dates inside the heart. |Online reservations strongly suggested. |This party is subject to cancellation if we have 2 or less paid reservations 2 hours prior to the start time. All guests will be notified of a cancellation with the contact information each guest provides if a cancellation occurs. |This is an 18 and older event. Parties for children are held on Saturday afternoons. We provide everything except for your food and drink! |Online reservations strongly suggested. |This party is subject to cancellation if we have 2 or less paid reservations 2 hours prior to the start time. All guests will be notified of a cancellation with the contact information each guest provides if a cancellation occurs. This canvas is faux finished to look like a wooden palette sign. It can be customized to fit your family and your décor. We will show you how to whitewash it to create the perfect rustic look! Bring some magic to your romance with a stroll through these vibrant and whimsical woods. The serene colors and calming view of wooded reflections on still waters are the perfect way to bring some tranquility into your home! Sip a glass of wine and imagine yourself on orchid sand in the shimmering moonlight. Whirl your brush, twist the colors, swirl the paint on the canvas to master this artful perfect dance. Bring your two left feet and create a waltz of color, texture and light at our “Graceful Dancers” night. 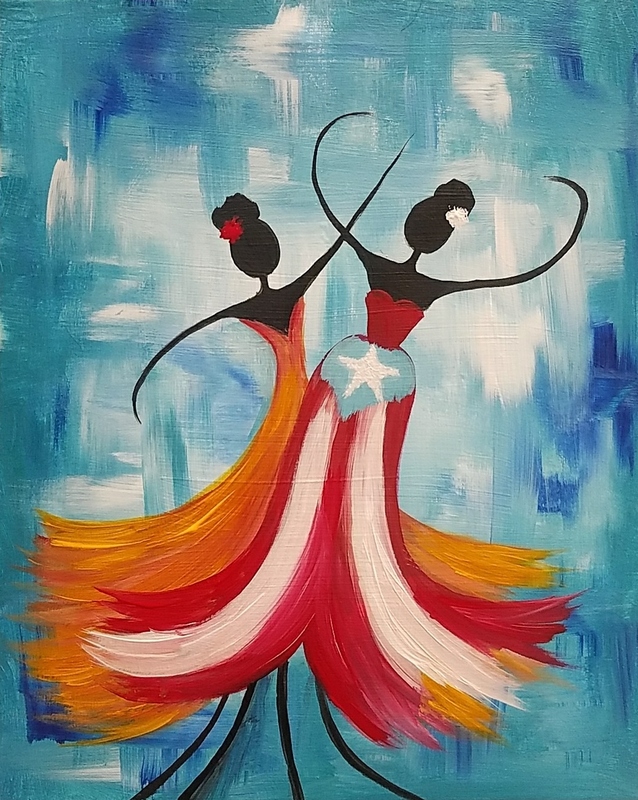 After the painting FREE salsa dancing lessons will begin in our main room from 3-4pm! Each reservation will donate to the Cuerpo de Baile Areito KC. This local dance group is a non-profit organization that represents the island of Puerto Rico and The Puerto Rican Society of Greater Kansas City. |Online reservations required for this event. A lovely silhouette of a tree standing strong against a backdrop of the setting sun and reflective waters.